Specifically formulated to improve the skin wrinkle, the A.G.E. 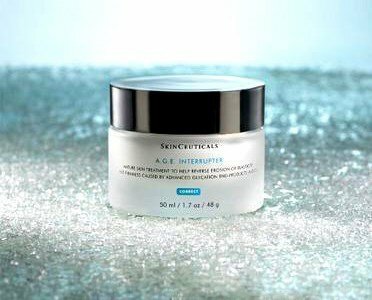 interrupter, improves the appearance of fine mature skin, caused by intrinsic aging processes. 0.2% of Fitoesfingosina -helps protect skin's natural barrier, relieving the discomfort associated with dry skin, derived from aging. Apply one to two times a day on the face, neck and neckline. Indicated for mature skin with deep wrinkles and sagging skin. Age: between 45 and 50 years. Free radicals accelerate the glycation process, by expected to associate an anti-oxidant to prevent- C and Ferulic, Phloretin C F, 10 Serum) and the Sheer Mineral UV Defense. For an attack treatment with rapid and visible results regarding installed aging signs, you should associate night Retinol 0,3. It should be associated at the beginning of treatment, and then 1 to 2 x per year. Corrective products from SkinCeuticals combine reparative, whitening and exfoliant ingredients to help rehabilitate the skin, restoring its youthful and healthy appearance. The perfect symbiosis between active ingredients and advanced technologies correct fine lines, wrinkles, hyperpigmentation, acne and more. Correct - SkinCeuticals is a line of specific treatments for skin problems. Skinceuticals specialist, Liliana Rosa, answered all your questions! And because these can also be your doubts, we leave a summary!